It's #openaccess week and The Wikipedia Library is taking part with a viral, microcontribution campaign called #OAwiki. The idea is simple: go to the web app OAbot, review a citation with a closed access (paywalled) link, check the suggested open citation, and add the open link to the citation if it's a good fit. This makes every citation on Wikipedia easier to access, read, and verify! I'd love it if you would try out http://oabot.org. Also if you could share in your networks and say something nice about it this week, we can push #openaccess even further! The video of the 2017 meeting held May 15, 2017 is now available at https://youtu.be/2pT0ogdjFBM. Included is a guest talk by Dr. Valerie Nesset. The meeting will feature a presentation by Valerie Nesset, PhD on “Information Literacy Instruction: Things You Need to Know But Maybe Don’t Know to Ask”. In the session, Dr. Nesset will offer insights into areas of information literacy instruction that may not be covered in LIS programs or ongoing professional development. Concepts related to information literacy such as indexing, classification, information behavior, user experience, and usability will be discussed. 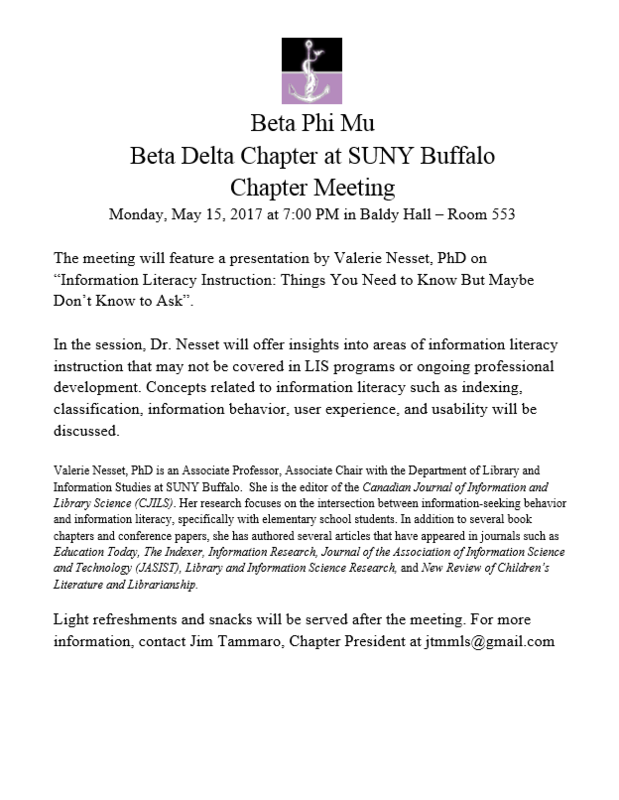 Valerie Nesset, PhD is an Associate Professor, Associate Chair with the Department of Library and Information Studies at SUNY Buffalo. She is the editor of the Canadian Journal of Information and Library Science (CJILS). Her research focuses on the intersection between information-seeking behavior and information literacy, specifically with elementary school students. In addition to several book chapters and conference papers, she has authored several articles that have appeared in journals such as Education Today, The Indexer, Information Research, Journal of the Association of Information Science and Technology (JASIST), Library and Information Science Research, and New Review of Children’s Literature and Librarianship. ​Dr. Nesset will be speaking on Information Literacy Instruction. An effort will be made to stream the meeting for those members not located in the Western New York Area who would like to participate in the meeting and listen to Dr. Nesset's presentation. More information to come in the near future. The Beta Delta Chapter of Beta Phi Mu will be holding our 2016 Annual Meeting on Thursday, October 20th at 7:00 PM in Baldy 553 on the North Campus of the University at Buffalo. 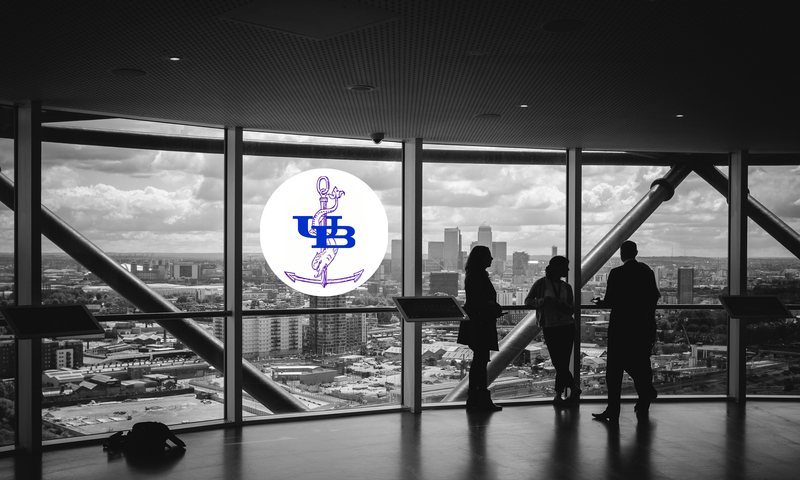 In response to the input received from our recent survey of the membership, we have made arrangements to have members not located in the Western New York (WNY) region attend the meeting via Skype. So, even if you’re not located in the WNY area, you can still be part of this meeting! If you wish to participate in the meeting via Skype, please e-mail your Skype information to Brenda Battleson White at blb@buffalo.edu. If you plan to attend in person, please email Brenda as well, to ensure that we have a large enough room for the meeting. The meeting will feature the announcement of the election results for chapter board officers for 2017. We will also review the results of the recent membership survey we conducted and discuss some exciting plans for the coming year. The Chapter Board is working hard to establish a dynamic and exciting chapter but we can’t do that without you so we hope you can attend and participate in this meeting on October 20th. Please join us for the 2016 Bobinski Lecture by Courtney L. Young, Immediate Past-President of the American Library Association. Date: Tuesday March 8, 2016, 7 p.m. Libraries of all types are leaders in their communities and empower community leadership. Building on her presidential themes of diversity, career development, and engagement and outreach, American Library Association Immediate Past President COURTNEY L. YOUNG will talk about the interconnectedness of the leadership roles librarians and staff play. She is currently Head Librarian and Professor of Women’s Studies at Penn State Greater Allegheny. In 2011, Courtney was named a Library Journal “Mover & Shaker,” recognized as a Change Agent for her ability to successfully make connections among a diversity of duties in her library, on campus, and in the profession. She is a graduate of the College of Wooster (OH) with a B.A. in English and minors in Black Studies and Women’s Studies, and Simmons College, where she received her M.S. in Library Science. This lecture is supported by The George and Mary Bobinski Lecture Fund. A reception following the lecture will be co-sponsored by Buffalo and Erie County Public Library, University at Buffalo Libraries, and the Western New York Library Resources Council. The Beta Delta’s annual meeting will be held on Monday, April 11th, 2016. Dinner will be at Sean Patrick’s Restaurant, 3480 Millersport Highway, Getzville, NY 14068. There will be a cash bar from 5:30-6:30 with dinner starting at 6:30 and the ceremonies beginning around 8:00 PM. Kimberly Davies Hoffman, Head of Outreach, Learning, and Research Services at the University of Rochester will be the featured speaker. With much success over the past 15 years working and teaching collaboratively at SUNY Geneseo, Kimberly Hoffman now serves as the University of Rochester’s Head of Outreach, Learning, and Research Services at the River Campus Libraries. Her interests lie in engaging pedagogy, instructional design, assessment, and creating professional development opportunities. She has been a founding member for programs like LILAC, the 3Ts,and RYSAG. Kimberly earned her MLS at the University at Buffalo and a BA in French and International Relations at the University of New Hampshire. Only use one form to reserve and pay for your seat(s). The cost per seat is $30. The Beta Delta's annual meeting will be held on Monday, April 11th, 2016. Dinner will be at Sean Patrick's Restaurant, 3480 Millersport Highway, Getzville, NY 14068. Watch the website for information about RSVPing. Email the board for further details. The Department of Library and Information Studies is pleased to announce the induction of eight new members into the local chapter of the library and information studies honor society, Beta Phi Mu. Congratulations to new Beta Phi Mu members: Tracy N. Dunstan, Sarah S. Easton, Andrea L. Fetterly, Allison M. Fischer, Eileen Bauer Gardner, Christina M. Karvounis, Amanda F. McCormick, and Kimberly J. Whittemore.